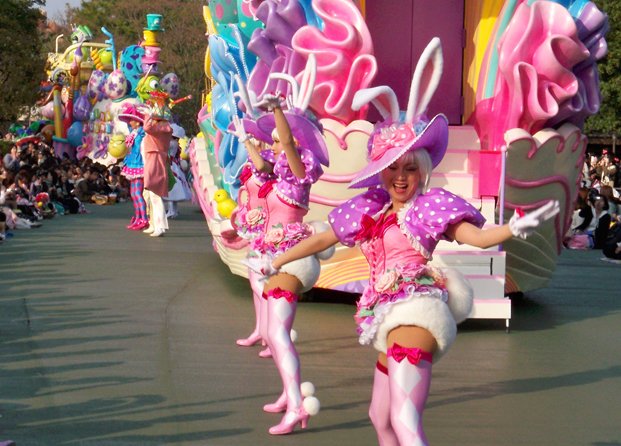 If candy was a deliciously animate object, it would manifest itself as Tokyo Disney. The resort’s sprawling backdrop strikes you the moment you step out of the train station. Each facade is made up of an entire palette of pastels seemingly spun from some sort of giant, cocoon of cotton candy. 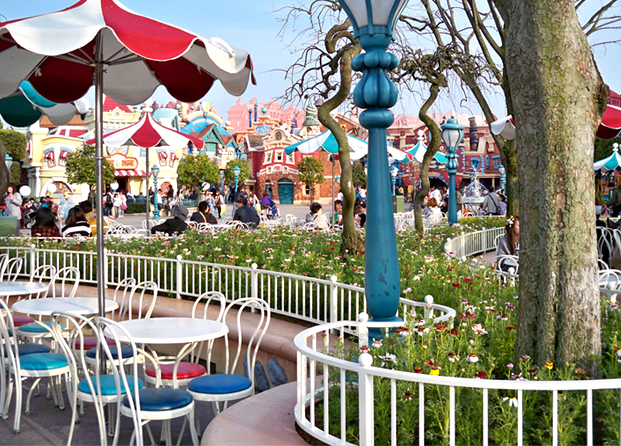 Tokyo Disney is the Willy Wonka of architecture and design. 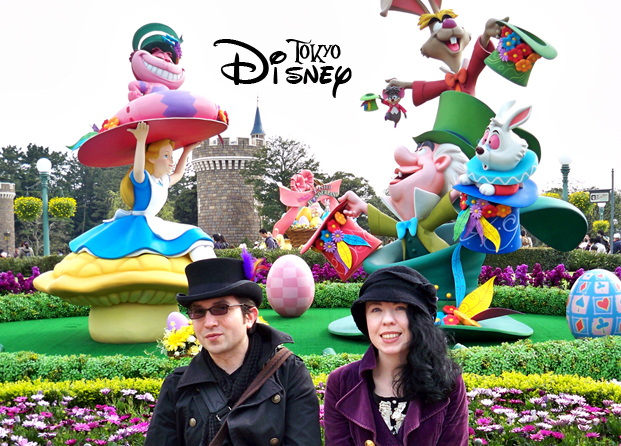 Optivion and I walked through the gates of Tokyo Disney and were immediately thrown into a headspin. The commercial-esque umbrella stroll of Mary Poppins trailed by a group of young girls wearing Mickey ears on our right. A brilliantly yellow topiary sculpture of Mickey Mouse on our left. The “Something Wicked This Way Comes” twirl of a nearby carousel. I even started to notice some of the fellow tourists. Out of the corner of my eye, I noticed a furtive figure dressed in an enormous Safari hat drowning in a puffy ascot and prop-sized camera. My first thought was, “how wholesomely cute”. It was a thought that frequently came to mind whenever I saw a costumed Japanese person. The Japanese fondness for accessories is astounding. If it’s time to clean-on goes the matching bandana and apron. If a new road needs to be laid-on goes the blue uniform with matching yellow shoes and hard hat. In a sense, the Japanese people had become something out of a Richard Scarry children’s book. It wasn’t until Optivion and I were drawn with headlight hypnotism to the Alice in Wonderland sculptures that I noticed that the same “cute” camera-wielding tourist was now a very tired and nervous Disney employee forced to conjole smiles out of serious fun goers. Optivion and I continued to walk pass vendors selling themed variations of cuteness and ambigiously Westernized food stuff (read greasey ham hocks). 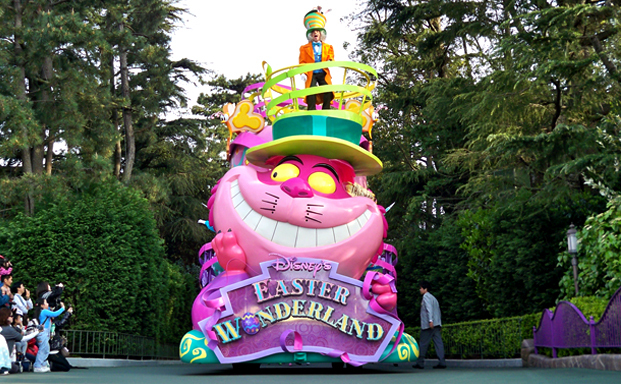 The Disney theme parks are by nature exceptionally surreal in incarnating movie magic however Tokyo Disney took it one step further by devoting a whole month to Alice in Wonderland. There was even a spiral-spinning (you guessed it) stomach-clutching tea cup ride. 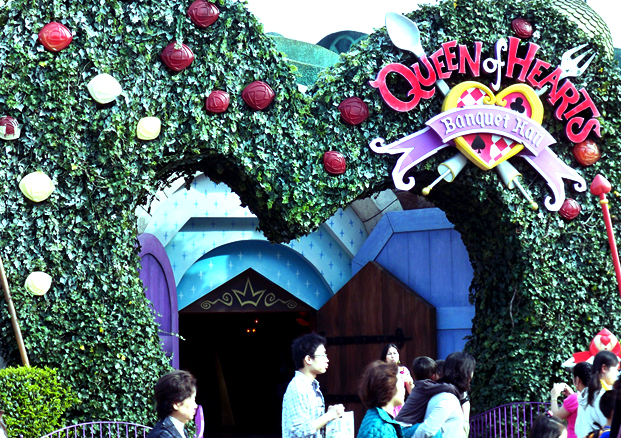 Awestruck, Optivion and I stared up at a Scissorhand-sized heart-shaped topiary gate that enclosed the entrance of the “Queen of Hearts” restaurant. The gimmicky-ness of the restaurant immediately dissolved under the incredible attention to detail. Lured by the life-sized card soldiers and the waitress attired in an argyle chef hat and apron (“wholesomely cute”), Optivion and I resigned oursevlves to touristly gluttony and sat down for a meal of heart-shaped cutlets served with Mickey Mouse cutlery. Next, we decided to wait for the large parade that was scheduled that day. We thought it would be a small platoon of smiling mascots and glittery floats on wheels. We sat down and surprisingly, secured first row seats near a Medieval sized door where the parade was expected to start. Suddenly, the green door burst open like an animated pinnata of colors. For the first time, I think my jaw literally dropped. Afterwards, we rode several rides which seemed like a strange anomaly of new-old. The rides had a certain 1950’s sense of simplicity. The Haunted Mansion had flickering candles and equally flickery holograms while The Snow White ride was like a spooky picnic on a rickety go-cart. Although the park seemed a bit dated compared to the leviathan that is Walt Disney Florida, everything still retained a coat of newness. It is easy to say that things seem better (or worse) when you’re in a foreign country. By default, everything takes on a filter of comparison and rarely is seen as what it is. Although, Tokyo Disney seemed somehow quieter and more peaceful (there was a lack of obnoxious families screaming at their children or at least it was concealed by the more whisperous tones of Japanese), it wasn’t that much more different than any other Disney resort. 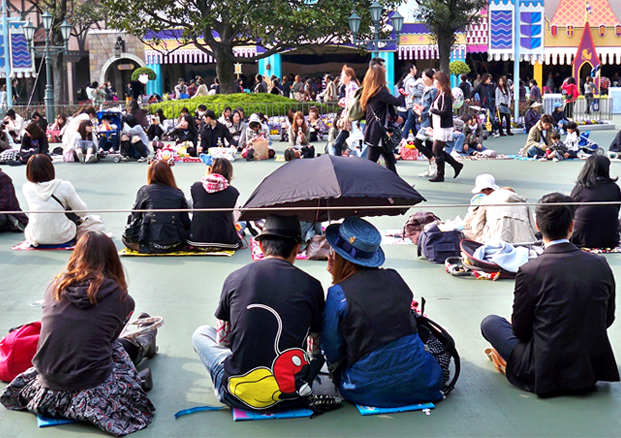 Tokyo Disney wasn’t bigger or cuter or superior. It was its own wonderful entity. The last ride that we went on was “It’s a Small World” which is made up of a large scale diorama of kewpie looking dolls representing each country except for the U.S. (they could have at least thrown in a cowboy or tiny SUV to represent). It was, well, wholesomely cute. It harkened back to a time when things were enough. When the rides didn’t have to be gimmickier or scarier or more advanced. 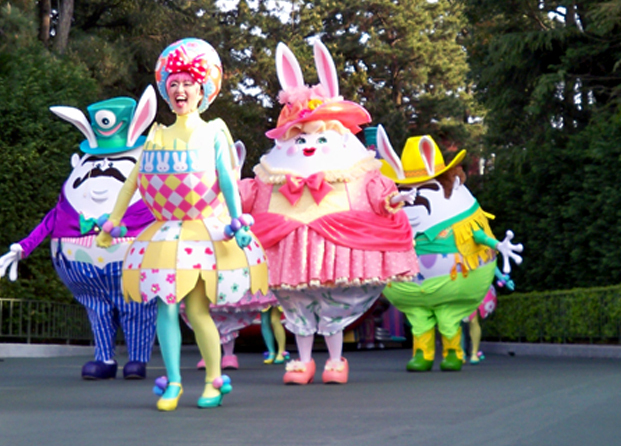 Tokyo Disney reminded me that each world, no matter how brightly you paint it, is linked by a small “time” after all.